Join us to celebrate new artwork at the Ben Franklin Bridge. Meet the artists and enjoy music, face painting, food vendors, and more! 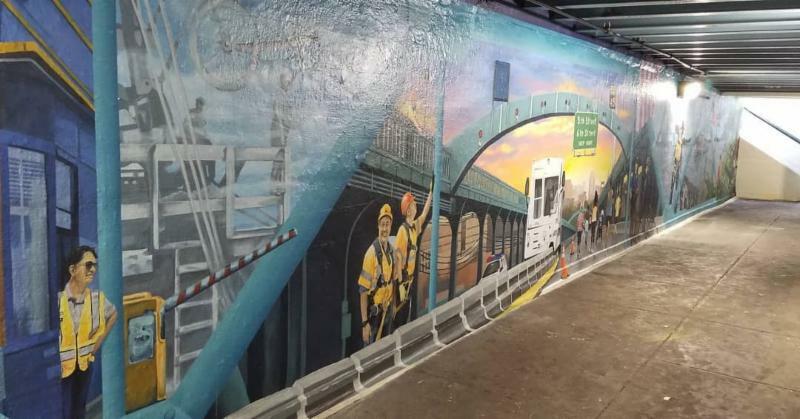 The DRPA, in partnership with Mural Arts Philadelphia, recently completed two new murals which adorn the walls of the 5th Street Vehicular and Pedestrian Tunnels located beneath the Ben Franklin Bridge in Philadelphia. The murals serve as visual enhancements for the surrounding community and utilize art to craft a better transportation experience for pedestrians, cyclists and motorists alike. The designs pay homage to past and present behind-the-scenes bridge workers, celebrate the varied communities linked by DRPA bridges and promote the Authority’s mission of stewardship, service and community. For additional information, visit drpa.org. 11:00 a.m. Event starts with music, face painting, chalk activities and food vendors.